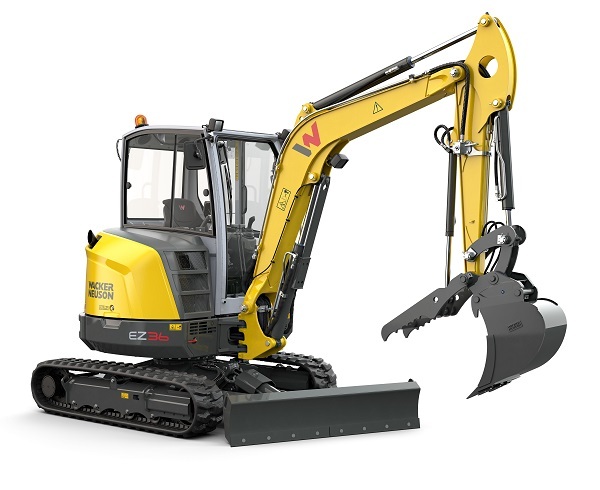 Wacker Neuson released a whole bunch of new equipment this week at World of Concrete. Let’s take a look at some of the highlights. The new SW24, SW28, ST35 and ST45 large frame loaders offer the latest in enhanced cab design and service accessibility. As the “big brother” to the medium frame line, these machines offer dealers and contractors parts commonality and a proven design on the jobsite. Two new excavators, the EZ26 and EZ36 models, combine technology and operator comfort to provide excellent productivity. New and more comfortable cabs, intuitive controls, unrestricted service access and compact design make these machines ideal for a variety of applications. A new line of track dumpers are ideal for handling material on smaller jobs, plus have the advantages of track machines. These mini track dumpers can travel and maneuver across rough terrain, as well as ﬁ t in tight spots. The largest articulated wheel loader in the Wacker Neuson ﬂeet, the WL95 can load, move and place more material efﬁciently. This highly productive machine features return-to-dig and ride-control as standard, plus a large, comfortable cab with multi-functional joystick and jog dial for easy adjustment of ﬂ ow rate. A new Certiﬁed Pre-owned equipment program allows end users to purchase premium products that are reconditioned under tight guidelines and provide additional beneﬁ ts compared to traditional used equipment.